Chronic suppurative otitis media (CSOM) is a disease of multiple etiology and is well known for its persistence and recurrence, despite treatment. CSOM is a destructive disease with irreversible sequelae and can proceed to serious intra and or extra cranial complications. The microbiological flora of the middle ear varies and depends on the type of otitis media. In the acute form, the major organisms present are Hemophilus influenzae, Streptococcus pneumoniae, Pseudomonas aeruginosa and anerobic bacteria. CSOM has received considerable attention, not only because of its high incidence and chronicity, but also because of issues such as bacterial resistance and ototoxicity with both topical and systemic antibiotics. The wide spread use of antibiotics has precipitated the emergence of multiple resistant strains of bacteria which can produce both primary and post-operative ear infections. The indiscriminate, haphazard and hay-hearted use of antibiotics and the poor follow up of the patients have resulted in the persistence of low-grade infections. The changes in the microbiological flora following the advent of sophisticated synthetic antibiotics have increased the relevance of the reappraisal of the modern day flora in CSOM, and their in-vitro antibiotic sensitivity pattern is very important for the clinician to plan a general outline of treatment for a patient and can minimize complications that may require surgery for a chronically discharging ear. The study of bacteriology and drug sensitivity is necessary to enable the treating family physician to plan the general management of CSOM and it is almost essential for the ENT surgeon to make the discharging ear dry for better results of myringoplasty and ossiculoplasty. The objective of this study is to determine the etiological agents and their antibiotic susceptibility pattern in CSOM patients for appropriate treatment. Out of 130 samples from patients enrolled in the study, 126 (96.92%) samples were culture positive. The most common organisms isolated were Pseudomonas aeruginosa 57 (45.24%) and Staphylococcus aureus 28 (22.22%) followed by other enterobacteriaceae members like Klebsiella Escherichia coli and Proteus spp. 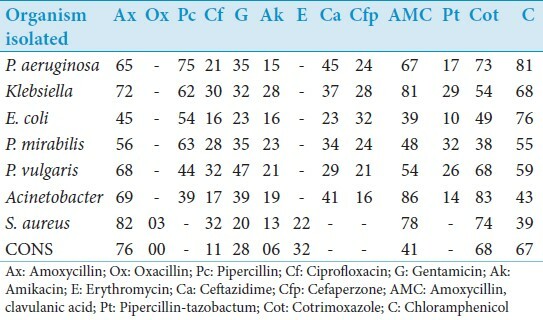 Details of various isolates from CSOM samples are depicted in [Table 1]. No growth was observed in 4 (3.08%) samples. Amikacin was the most effective antibiotic in the present study. It was effective against maximum number of strains (82.37%), followed by Ciprofloxacin (76.62%), Cefaperazone (75.83%), and Gentamicin (71.4%), Ceftazidime 76 (65.16%) [Table 2]. CSOM is a condition of the middle ear that is characterized by persistent or recurrent discharge through a chronic perforation of the tympanic membrane. Untreated cases of CSOM can result in a broad range of complications. Four (3.08%) samples were sterile in present study. This is in comparison with the results found by Kumar et al.,  (4.39%) and Vijaya et al.,  (5.28%), while Chakraboty et al.,  (12.6%), Vijaya et al.,  (17.6%), and Fatma et al.,  (16.9%) found higher percentage of sterile samples. This may be due to prior antibiotic therapy. All samples in the present study yielded single type of organism. Kumar et al.,  and Fatma et al.,  also reported 93.1 and 94% of monobacterial growth in their studies, respectively, while Vijaya (1998)  reported only in 51% of samples. Pseudomonas continues to remain supreme as primary offender and poses problem for effective therapeutic control. Staphylococcus aureus bear the inherent trait of resistance. In the era of antibiotics, the emergence of antibiotic resistance is becoming more common. Patient non-compliance is an important factor responsible for the development of antibiotic resistance. As soon as symptoms subside, many patients stop taking antibiotics before completion of therapy and allow partially resistant microbes to flourish. Such practice should be condemned strongly and patients should be educated to avoid the same. Knowledge of the pathogens and antibiotic sensitivity pattern responsible for CSOM and choosing suitable antibiotics according to susceptibility tests should guide the management of disease treatment and reduces intracranial and extra cranial complications with CSOM. 1. Poorey VK, Arati Iyer. Study of bacterial flora in CSOM and its clinical significance. Indian J Otolaryngol Head Neck Surg 2002;54:91-5. 2. NikakhlaghS AD, Khosravi A, Fazlipour M, Safarzadeh N. Rashidi Microbiologic findings in patients with chronic suppurative otitis media. J Med Sci 2008;8:503-6. 3. Kumar H, Seth S. Bacterial and fungal study of 100 cases of chronic suppurative otitis media. J Clin Diagn Res 2011;5:1224-7. 4. Taneja MK. CSOM: A bacteriological study. Indian J Otol 1995;1:24-7. 5. National Committee for Clinical Laboratory Standards. Performance Standards for Antimicrobial Susceptibility Testing. Wayne, PA, USA: NCCLS; 2001. p. M100-S1. 6. Kumar S, Sharma R, Saxena AK, Pandey A, Gautam P, Jain R. A study of bacterial flora and sensitivity to antibiotics in cases of CSOM TTD in western UP. Indian J Otol 2008;14:20-4. 7. Vijaya D, Nagarathnamma T. Microbiological study of chronic suppurative otitis media. Indian J Otol 1998;4:172-4. 8. Chakraborty A, Bhattacharjee A, Purkaystha P. Microbiological profile of chronic suppurative otitis media: Its significance in North-East India. Indian J Otol 2005;11:39-44. 9. Fatma AA, Assiry S, Siraj MZ. Microbiological evaluation and aspects on management of chronic suppurative otitis media in Riyadh. Indian J Otol 1998;4:115-20. 10. Vijaya D. Aerobes, anaerobes, and fungi in chronic suppurative otitis media. Indian J Otol 2000;6:55-8. 11. Goyal R, Aher A, De S, Kumar A. Chronic suppurative otitis media-A clinico microbiological study. Indian J Otol 2009;15:18-22. 12. Hegde MC, Bhat GK, Sreedharan S, Ninan GP. Bacteriological study of tubotympanic type of chronic suppurative otitis media. Indian J Otol 2005;11:13-6. 13. Loy AH, Tan AL, Lu PK. Microbiology of chronic suppurative otitis media in Singapore. Singapore Med J 2002;43:296-9. 14. Lakshmipathi G, Bhaskaran CS. Bacteriology of chronic suppurative otitis media. J Indian Med Assoc 1965;45:436-40. 15. Gulati J, Tandon PL, Singh W, Bais AS. Study of bacterial flora in chronic suppurative otitis media. Indian J Otolaryngol Head Neck Surg 1969;2:198-202. 16. Ayyagari A, Pancholi VK, Pandhi SC, Goswami A, Aggarwal KC. Anaerobic bacteria in chronic otitis media. Indian J Med Res 1981;73:860-5. 17. Vijaya D, Geeta SH. Microbiological study of discarging otitis media. Indian J Otol 2003;9:17-9. 18. Naheed P, Khan Z, Khan IM, Suhail AS, Zuber A. Bacteriological study of patients with discharging otitis media-A rural study. Indian J Otol 2003;9:29-32. 19. Rajendra Kumar PV. A study on the incidence and aetiology of deafness in a south Indian population. Indian J Otolaryngol Head Neck Surg 1974;26:153-7. 20. Gulati SK. Investigative profile in patients of chronic suppurative otitis media. Indian J Otol 1997;3:59-62. 21. Anupam M, Girish S, Devika N, Chandra MS. Bacteriological study of chronic suppurative otitis media. Indian J Otol 1999;5:87-91. 22. Kuchal V. Antibiotic sensitivity pattern in chronic suppurative otitis media (Tubotympani type) in Kumoun region. Indian J Otol 2010;16:17-21. 23. Singh N, Bhaskar R. Microbiological study of otitis media. Indian J Otolaryngol Head Neck Surg 1972;24:161. 24. Rao MV, Jayakar PA. Bacteriological study of CSOM. J Indian Med Assoc 1980;75:30-4. 25. Rao BN, Reddy MS. Chronic suppurative otitis media - A prospective study. Indian J Otolaryngol Head Neck Surg 1994;3:72-7. 26. Friedmann I. The pathology of acute and chronic infections of the middle ear cleft. Ann Otol Rhinol Laryngol 1971;80:391-6. Kumar, S., Sharma, R., Saxena, A.,Gautam, P., Taneja, V.